Being perfectly honesty, I don’t really like mess of any kind. But trying to find new ways to play is sometimes messy but it is a kind of mess that is purposeful and joyful, a discovery of sorts. 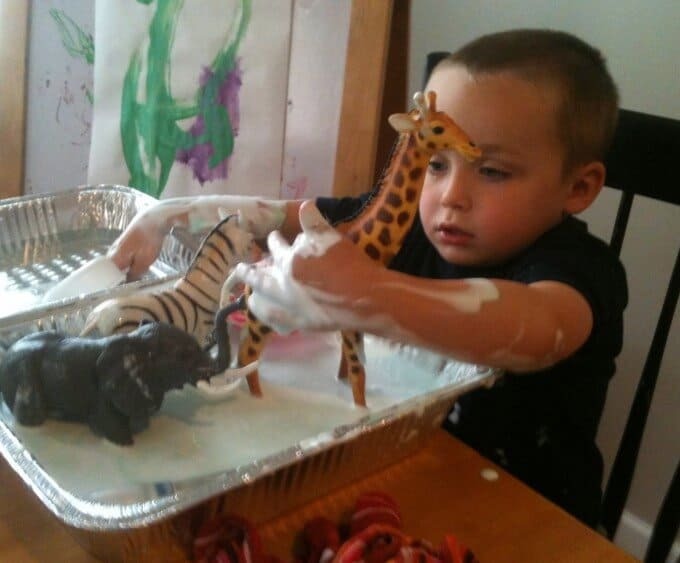 So we’re discovering messy play in a whole new way. I like neatness and order but my house is usually neither. I don’t like clutter but so be it. Every once and awhile I go a bit clutter crazy and just recycle anything I don’t want to look at anymore or that I haven’t moved in a while. I don’t like dirt so much but I am ok with it (broom is always handy). Having a three-year old is a messy job and that is still ok with me. 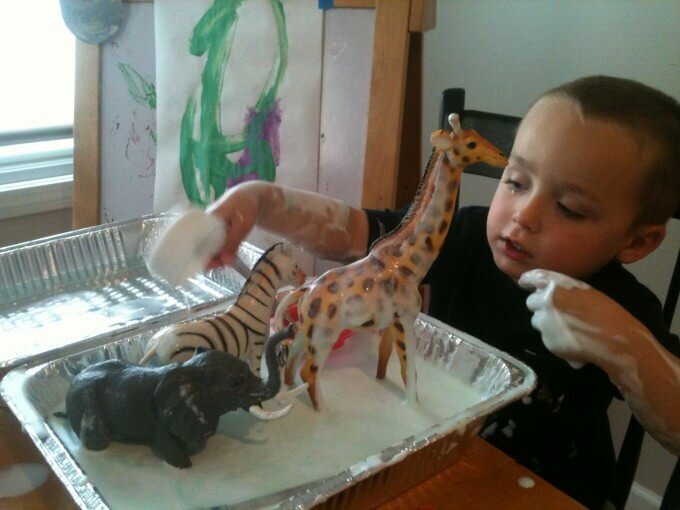 I try to remind myself that messes are part of learning, exploring and experimenting. I want him to feel the textures that are around him, gritty, slimy, squishy, sticky and not shy away from them or be afraid of them. I want him to embrace the sensations and delight in the entertainment they offer. So every Monday, I have decided to create a new messy Monday project. Generally I have reserved those mornings for what little “housework” I actually do so it might work out well. We didn’t do anything special this monday since he asked to go to the beach area near our YMCA. He had an interest so I followed him and we dug around in the wet sand. He got pretty messy anyway if that counts! Since I haven’t come up with a super cool messy idea yet (got some ideas), I figured I may as well share a few photos from the past. I have to be very hands on with Liam (meaning get messy) so I don’t often take photos except for those in my memory. Getting messy usually requires me to be mentally prepared to offer up this kind of activity and actually get all messy, change clothes etc but that’s all ok if we can find a few minutes together to laugh and create memories. I have found it’s all ok in the end even if we laughed for just a few minutes. Sometimes I wished I remembered that a bit more when in the middle of an activity or if the activity doesn’t last as long as I had planned or as long as it took to even set it up! 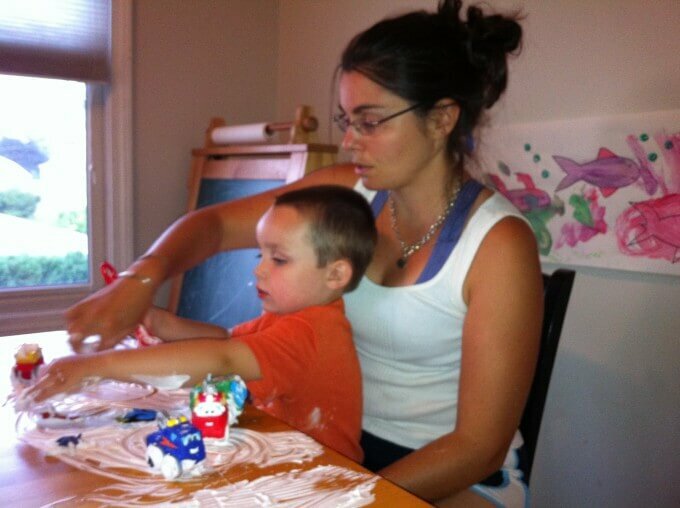 Liam can be pretty rigid about what he will and will not play with in terms of messy sensory materials and sometimes will not like it when it sticks to much to him. 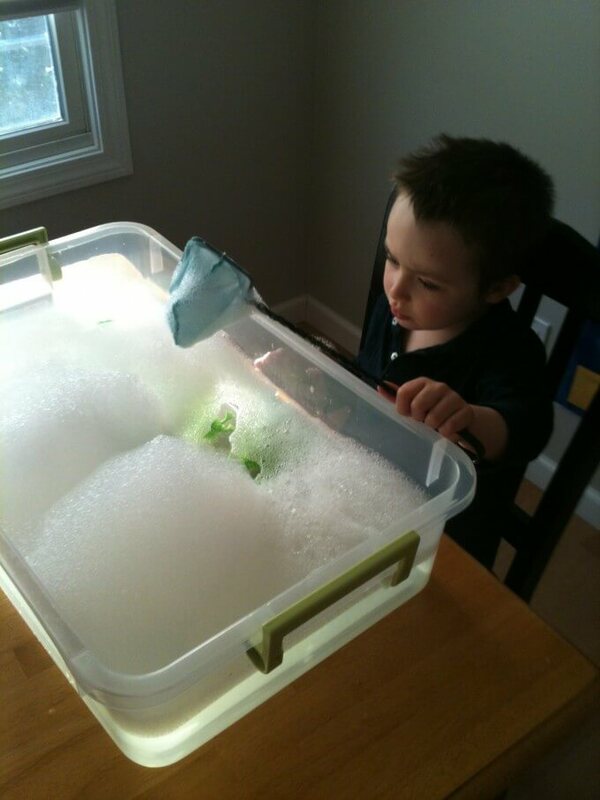 Like this morning, he wanted a tub of water with bubbles but then the bubbles were sticking to everything and he kept wanting to wash everything off, so I changed to non-bubble water which he agreed upon. You can see he looks kind of sad with the bubbles on the net but then is more willing to play when it is bubble free! He begged me for blue water and bubbles when he woke up this morning. Yikes!!! So bubble play has to be more wet than bubbly and apparently that ratio was not correct this morning and I am not sure if I know what the correct ratio is, if it changes on a full moon, or if it just doesn’t really exist. The same goes for shaving cream and sometimes the shaving cream doesn’t feel quite right either and we end early. He does prefer clean hands but doesn’t seem to mind a dirty face! Which is fine with me since again I am ok with it being dirty now these days. He is a kid right? Little kids get dirty. Here I am always encouraging him to get his hands dirty, I feel it’s a little unfair to get after him about being dirty. He is only three right? Daddy does bath time anyway! I am looking forward to exposing him to some new ways of playing with the old stuff and fun ways to play with some new stuff. It is always a gamble in terms of interest, but always worth the try. 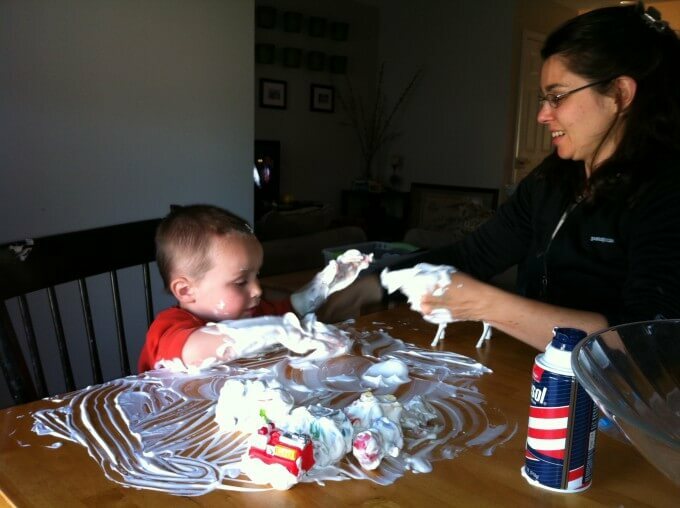 Shaving cream gets sprayed straight onto the table. Works for us and seems to clean the table top nicely when we are through. Though the table is of no value to us so that makes it even easier! He always needs some cars to run through and some scoops to make piles. Food coloring is fun and we have scooped “ice cream” into glass ice cream parlor dishes. 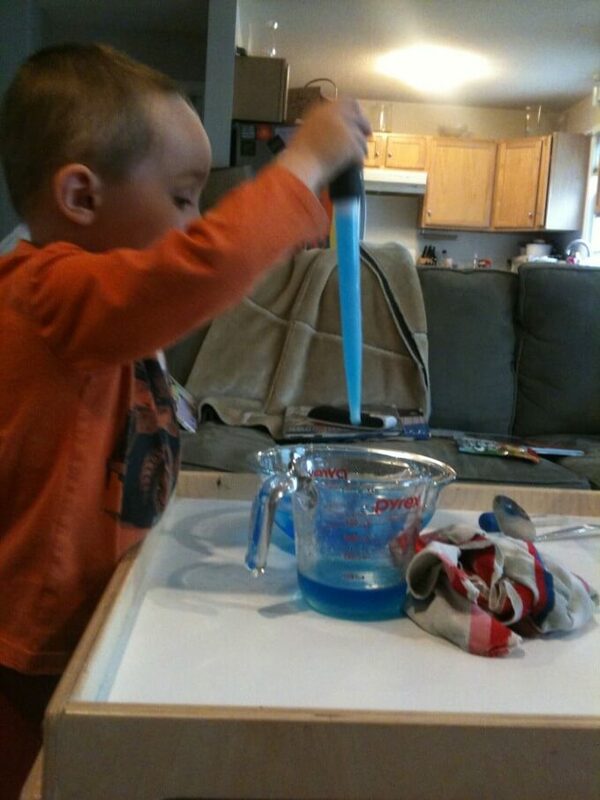 He has been working on color mixing at school so maybe we will try that with food coloring sometime. Large vinyl animals are fun to give pretend baths to and sometimes just squashing it about is enough to satisfy a sensory craving. Jello, mud, soap flakes are all on the radar. I came up with this one when he started taking an interest in the ice-cube bin in the freezer and wanting to play with the cubes. 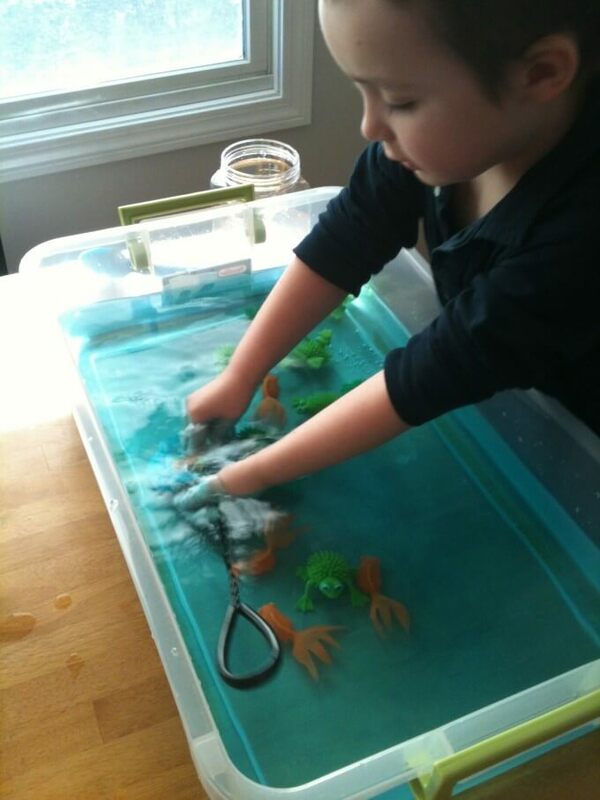 I am always looking for ways to sneak in fine motor skills so this is great for that . He loves when I set out two bowls. One is filled with ice and the other is filled with colored water. 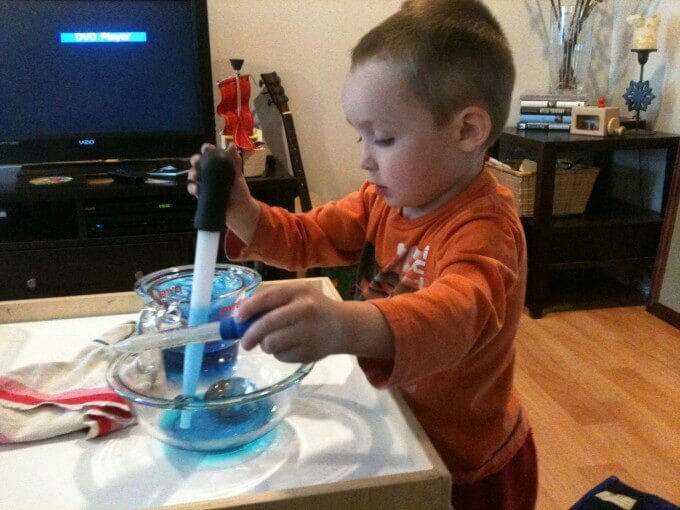 I give him a baster and a set of tongs and he sets out transferring the two back and forth. Yes, that is real glass. (He regularly uses real glasses and dishes to eat and many of his activities have ceramic or glass bowls.) 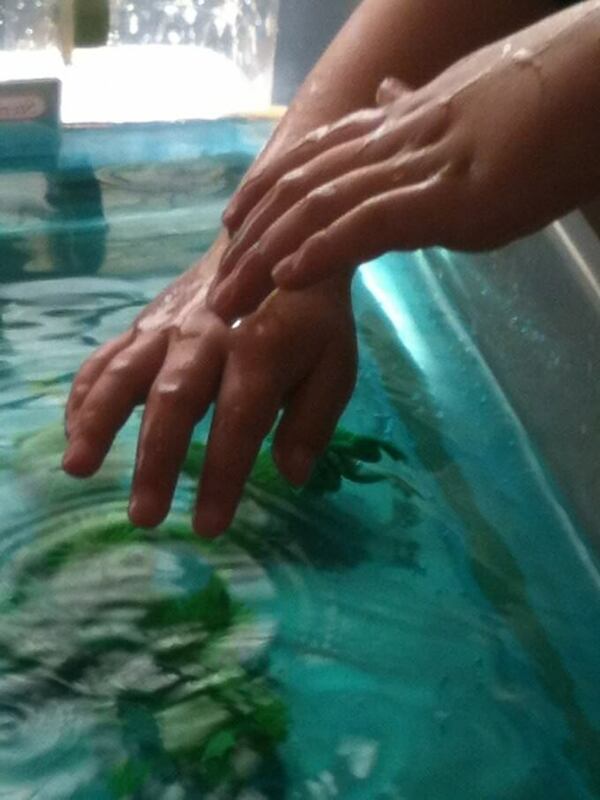 Eventually, he sees the ice melting which is a nice way to talk about freezing and melting! Sometime we add arctic animals (plastic) and talk about cold weather animals and the places they live. Most of all, I try to keep it simple and make play from what we have around the house. 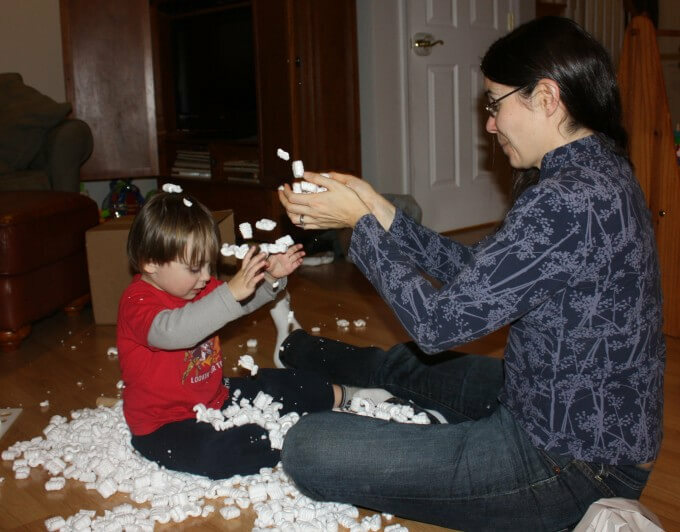 Styrofoam packaging peanuts anyone? I want to keep it coming from the heart. I want to keep it easy. I want to keep it joyful. I want him to see and feel that play is what you make of it and not necessarily what you have to play with that makes it fun! I’m a big fan of mess! I think Malone would like a treasure hunt in jello! We can have a messy Monday together! Thanks for the comment Shell! I bought a few supplies today! Stop by again and see our big messes. Still a gamble if Liam will have a sensory issue with them but I can’t wait to try!